The Lobero Theatre held a benefit concert to help City College’s music program on Wednesday, Oct. 10, 2018 in Santa Barbara, Calif. 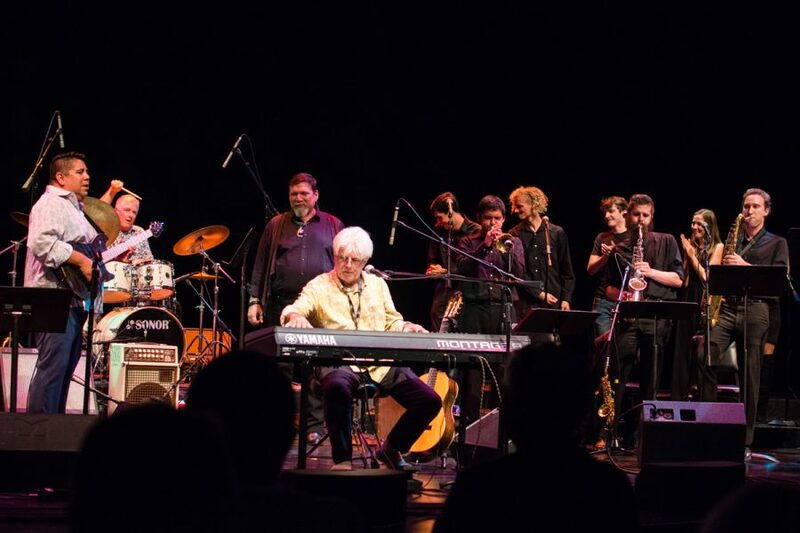 The concert was headlined by former Doobie Brothers member Michael McDonald, and also featured City College’s New World Jazz Ensemble, singer Tess Erskine, and the Lunch Break Jazz Band. The historic Lobero Theatre Wednesday was filled with the vibrant sounds of music, headlined by Michael McDonald, to raise funds for City College’s music program. The concert was both a wonderful tribute to music and a useful way to raise money for the program. A recurring topic of the night was the fact that this concert had been in preparation for over two years, and all of that preparation led to a memorable, energetic night. McDonald was accompanied by City College’s own New World Jazz Ensemble, which is directed by Tony Ybarra, an adjunct professor of music. The two spoke of each other as old friends, and their companionship was a delight to see. One of the bands they played tribute to was Steely Dan. McDonald played keyboard for the band, and it was his keyboard skills that most stand out. The audience held onto every note of McDonald’s keyboard playing, which was truly masterful. Whether it was a slow, ballad type of song or a fast, upbeat tune, he added a fantastic sound to the songs. McDonald’s music career has spanned over 45 years and he has accumulated five grammy awards. Many of his fans have followed him throughout his entire career, and he did not seem to disappoint. He was an incredible performer, lending his vocal talents to the works of several artists. Some of the pieces played were originally performed by Ray Charles and McDonald’s own band, the Doobie Brothers. The audience was incredibly receptive of the headlining artist. Songs were met with loud cheers and shouts of “we love you, Michael!” You could feel the crowd reliving their younger years, which added to the overall fun atmosphere. Towards the end of the night, the aisles started filling with people dancing. Although McDonald was the star of the show, he was backed by more incredible talent. The members of both the New World Jazz Ensemble and the Lunch Break Jazz Band displayed immense mastery of their respective instruments. There were several impressive brass soloists that displayed serious breath control and musical skills. The two keyboardists were also noteworthy, as well as the backup singers. 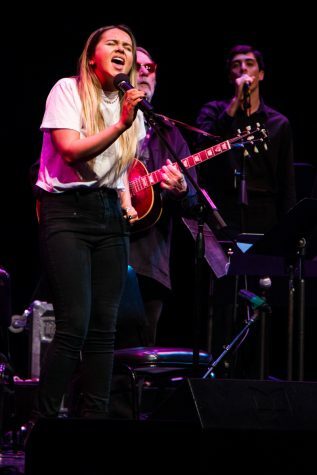 Tess Erskine sings alongside John Clark, City College’s music department Chairman, at the Lobero Theatre in Santa Barbara, Calif., on Wednesday, Oct. 10, 2018. Erskine grew up in a musical household and has been singing and creating music from an early age. Dr. John Clark, chairman of the City College music program, made an appearance at the concert, backing one of his former students. Clark is responsible for the City College songwriting class, and one of his alumnae made an appearance. Tess Erskine sang several of her own songs at the concert. She started her set with “Making Up Your Mind,” which she shared was the first song she ever played at City College. She finished her set with Demons, which really stood out for its synth sound. Erskine had an incredible voice, and she seemed incredibly confident when she sang. Though she appeared to be quite modest and a bit unsure in between her songs, and soon as she started singing, she completely broke out of her shell. The concert itself took place in the historic Lobero Theatre, California’s oldest continuously operating theater. It has a seating capacity of 604, and the show was entirely sold out. The floors vibrated with the loud playing of the various bands. There were a few technical difficulties, but overall, the small and intimate atmosphere only contributed to the feelings of companionship that seemed to be shared between the audience and the performers. The concert was a wonderful tribute to all that makes music wonderful, and was an extremely worthwhile way to submit a good cause.